Amdavad Ni Shaan is a Live Cultural Show which will be held on 7th October, 2017 at Karnavati Club, Ahmedabad. Yes, you guessed it Right!!! We are talking about India's most versatile and sensational singer Shaan. He became a hit sensation with the release of his album Tanha Dil. VENUE: Karnavati Club, S.G. Highway, Satellite, Ahmedabad. AmdavadNiShaan is a live cultural show to be held first time in India to celebrate a city. 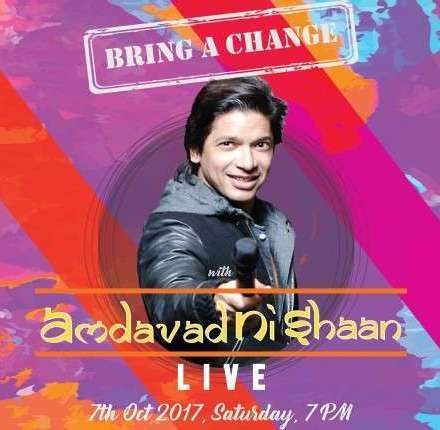 India's sensational and most versatile singer pays tribute to the nation's most diverse city Ahmedabad in AmdavadNiShaan - Bring A Change. So what are you waiting for....?? Book your tickets for yourself, your family and friends and get enthralled for the amazing musical night at AmdavadNiShaan - Bring A Change.